Just like a lot of other parts of your home, it’s easy to ignore your garage door until something goes wrong. While you should always call an expert if there is something wrong mechanically, if you’re just ready to spruce it up you can more than likely take care of it yourself. 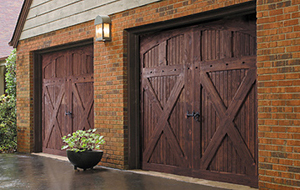 Here’s some information on how to properly refinish a wood garage door. Before you try to refinish a wood garage door you need to first make sure that it is in good shape. Your door more than likely moves at least two times every day, and that can lead to a great deal of stress on the panels. Look for any gaps or cracks in the finish, which can lead to water damage. If you see that sort of surface damage, then you will probably want to refinish the door. You should use a penetrating oil finish because that will be more flexible and hold up against stress. You can easily access the entire door to do this job; all you’ll need to reach the top is a small stepladder. Before you refinish a wood garage door you first need to make sure it’s clean. Many people overlook this step and wind up regretting it. If you don’t thoroughly clean the door first, debris such as dirt and dust can get into the finish and cause an unsightly result. If there is any loose paint or varnish, scrape or sand it off. You may need to use a cleaning solution if you spot any mold or mildew. Be very leery about power washing, however – that could cause damage to soft wood. Simply use a brush and a garden hose to stay on the safe side. It’s important that you pay attention to both sides when you refinish a wood garage door. Because the inside is as susceptible to expansion and contraction as is the outside, you need to make sure to protect it as well. If you have any questions, contact an expert with Action Garage Door online or call us at 972-215-7906.